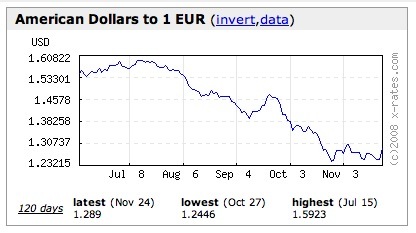 Here’s a rumour I’m looking forward to following – the fall of the EURO? I haven't been following the EURO too closely, just keeping my head in the sand because it's out of control and we just know that on our upcoming trip we'll be almost doubling shop window prices to get the dollar equivalent. ... For a long time, every economist and banker we know has said that the EU can't tolerate an over-valued EURO for too long. Yet, it has continued to rise, topping out at the beginning of August at $1.59, before a precipitous $.08 drop in the last two weeks (as shown in this chart at Yahoo Finance ).